From version 2.72 the problem with paths, folders or files with spaces and environment variables was fixed! 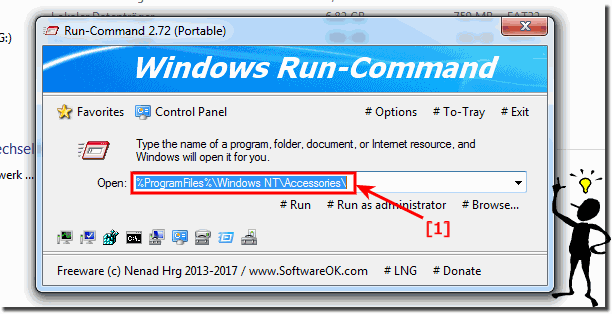 "%APPDATA%\Media Center Programs" or for example "%ProgramFiles%\Windows NT\Accessories"
It came to an error message by Run-Command. From version 2.72 everything is OK again! Please always use ... the latest version of Run-Command! (Image-1) Folder Paths with blank spaces and environment variables command! Run-Command - FAQ-6: Paths problems with blank spaces and environment variables, solved!